Color your Life with Crystals! Do you feel your eyes sparkle whenever you look at gemstones? Do they make you feel peaceful, or maybe even a little magical? This book will be your guide to discovering the magic of crystals and how they can help you. Imagine you are a rainbow of different colors! The colors you areshining are called ‘chakras’ and crystals can help you shine them even brighter. Find out about yourself, your crystals, your colors (chakras) and the power of imagination and positive thinking. With this book in hand, go out and create your life, and fill it with light, beauty and color! Cyndi Dale, author of award-winning The Subtle Body: An Encyclopedia of Your Energetic Anatomy and fourteen other books. Most kids are naturally attracted to stones and nature and this valuable guidebook builds upon that inherent attraction, giving children permission to fully explore and integrate universal truths that they’ve had inside them all along! Margaret Ann Lembo is a seasoned pro. Her contagious enthusiasm, along with tantalizing activities, will pull children into the fascinating world of metaphysical exploration and set them on the path of working skillfully with the natural energies that surround them. A wonderful introduction for tomorrow’s powerful manifestors! With warmth and wisdom, Margaret Ann Lembo continues in her sparkling role as teacher of the crystals, with this generous and down-to-earth guide for children of all ages. Practical help with crystalline energy, and the perfect resource for this magical new generation. —Sara Wiseman, Author of Your Psychic Child, Becoming Your Best Self and Writing the Divine. 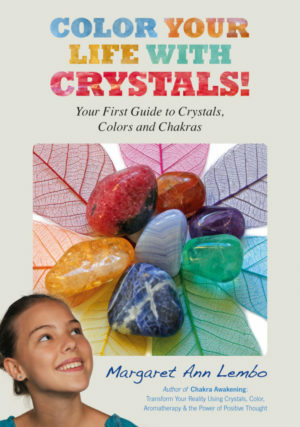 Color Your Life with Crystals is exciting and thought-provoking. It would be hard to imagine a better book for someone starting to explore this fascinating subject. Margaret Ann Lembo is an excellent writer who explains everything clearly and concisely. She is a renowned expert on crystals and her enthusiasm for her subject is evident in every word. Highly recommended. —-Richard Webster, author of over 100 books include best-selling books Spirit Guides & Angel Guardians and Creative Visualization for Beginners (Llewellyn). This book is key for children to read to receive a positive message that can help them grow and deal with real life situations. In my 25 years as an educator, I’ve never run across a book that teaches children a new subject, a different language, and with such an inspiring message. I recommend this book to teachers of grades 2-8 and urge you to consider “Color Your Life with Crystals” as a non-fiction choice for your proficient readers! ——Lisa Paolo, MA Ed., Former NYC Principal, Member of United Federation of Teachers, National Association of Secondary School Principals, Mother of 5 children.